Go Parikrama (circumambulation of the cow) and Go Mata Puja (worship of the cow) helps in overcoming all forms of problems in life as per Vishnudharmottara Purana. Evil actions and activities of enemies can be stopped by Go Parikrama. Here are few methods of puja to get the blessing of Go Mata and the benefits of performing worship and circumambulation of the cow. Taking care of cow keeps out all forms of inauspiciousness in life. Feeding roti to cow earns merits and it helps in desire fulfillment. Feed laddoo made of sesame (til), jowar or jaggery to nine cows and do their parikrama, if you are having a problem in conceiving or having children. This form of worship also helps to alleviate mental troubles. To solve problems between wife and husband, the couple should feed nine cows with roti made of til oil along with jaggery (gud) and perform parikrama. There will be peace and happiness in the family and life. If pregnant women perform parikrama of a cow, it is believed that they will have an easy pregnancy, labor, and delivery. Feeding a cow daily with roti mixed with jaggery helps in having good health. Moving the hand from face of the cow to its tail and then rubbing one’s body also helps in having a good health. Those facing trouble in getting married can find relief by feeding nine cows with roti and then doing their parikrama. The same can be performed for early and good marriage. 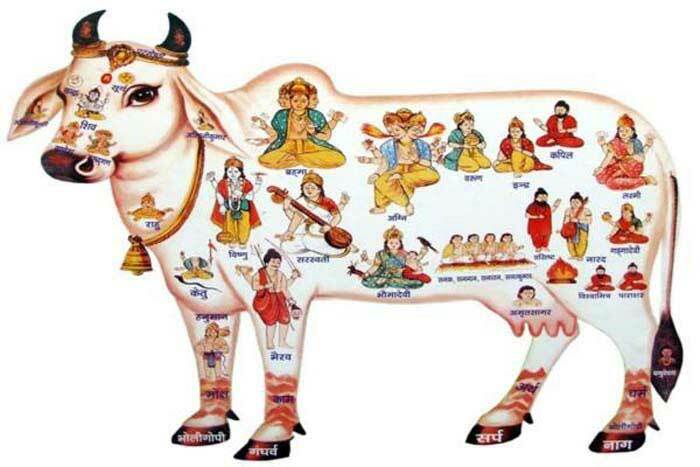 Doing puja of the front leg of the cow with kumkum, akshat, flowers, water, milk and jaggery helps in attaining moksha. Such puja is also performed for peace and prosperity in the family. To have good children couples who have conceived should do parikrama of a cow.